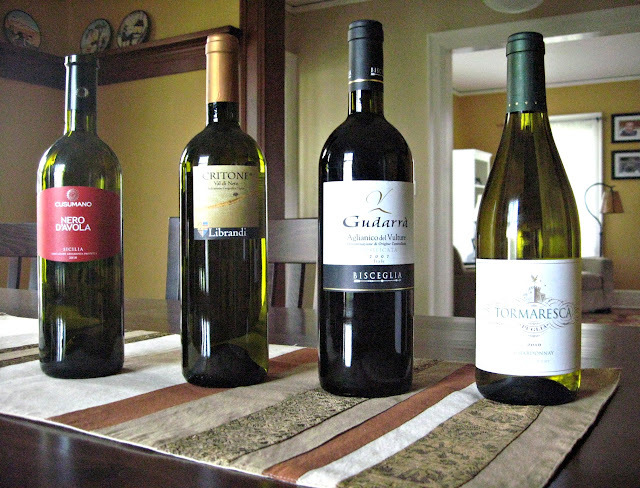 We’ve been aiming to begin reviewing southern Italian wines for some time now and have finally started the process! 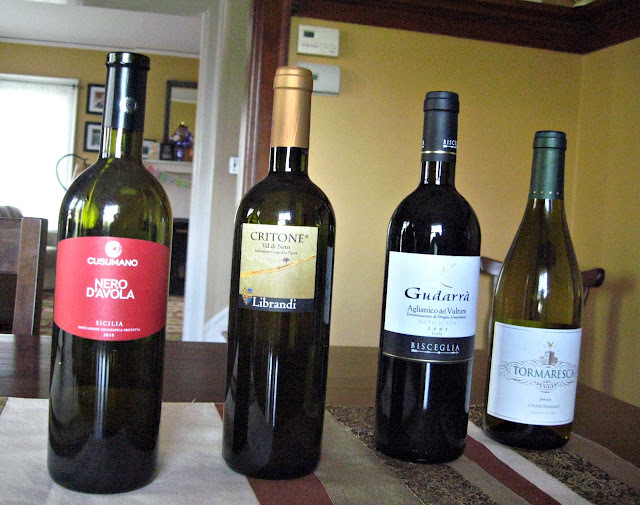 Today we’ll look at four wine regions from southern Italy, including Puglia, Calabria, Basilicata, and Sicilia; specifically, Tormaresca Chardonnay, Bisceglia Aglianico del Vulture, Librandi Critone Val di Neto IGT, and Cusumano Nero d Avola. We promise not to be biased towards Calabria! The Bisceglia Aglianico del Vulture 2007, priced at $20.89 via Wine Chateau, comes from an extraordinary region of southern Italy (on the heel of Italy’s boot); specifically, from a volcanic site. Like any classic Aglianico the nose has great sandy and smoky scents (after the bottle has a chance to develop; this is a good wine to decant) and the texture/mouth feel is lush and soft. The wine has a ton of cherry fruit and good minerality and beautiful tannins. The only negative is a mediocre finish (though it has great forwardness). We like this wine with rich pasta sauces, roasted baby goat or rabbit, and eggplant. The Librandi Critone Val di Neto IGT 2010 hails from my parent’s province of Calabria and is made mostly from chardonnay (with about 10% Sauvignon Blanc) so it shares some similiarities in flavor with the Tormaresca Chardonnay. The Librandi Critone is crisp and dry tasting and it has classic elements of green apple, grass, peach (and,again, no oak or vanilla). I like the Librandi Critone, priced at $13.69, with tomato salads, lunch salads made with arugula and grilled vegetables, raw oyster and clams, and any grilled fish. Nero d’Avola is the most planted red grape in Sicilia and is become increasingly popular in the United States. Cusumano Nero d Avola Sicilia IGT 2010 is a readily available Nero d’Avola and is a more fruit forward example of Nero. The Cusumano has overt strawberry and cherry flavors with some oak flavors. The wine is very chewy in terms of mouth feel and slightly full bodied. At $10.49 the Cusumano Nero d Avola Sicilia IGT 2010 is a decent, readily available, Sicilian wine though with a little digging one could find better examples of Nero d Avola for just a few dollars more. A cousin of mine just lead me to your site. Fabulous. One comment (from your review of a wine from Basilicata). Calabria is the toe of the Italian boot, Puglia is the heel. Basilicata is the ARCH of the boot, the arch of Italia. This particular week’s DVD AND BLU-RAY produces possess a actual macho high quality. “Albert Nobbs, inch Quality B-plus: Probably the most effective times within movies tend to buy dvds online cheap be individuals with absolutely no conversation as well as small motion.